In a series LCR circuit, the voltages across the inductor and capacitor are 18V and 12V respectively. If the output of the alternating voltage source connected to this series LCR circuit is 10V, what is the voltage drop across the resistor? 10 = √(VR2 + 62) where VR is the voltage drop across the resistor. From this we obtain VR= 8V. 15 = √ [VR2 + 52], from which VR = √200 = 10√2 volts. What do you grasp from the above discussion? Certainly this: You cannot add voltage drops in AC circuits as scalar quantities. 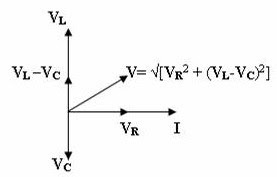 You have to perform vector addition taking into account the phase relation between the current and the voltage in the components. Here you have to forget your habit of scalar addition you perform in the case of direct current circuits! Instead of giving you the resistance of the coil, you are given the direct voltage and the resulting direct current to enable you to calculate the resistance: R = V/I =100/1 =100 Ω. When the alternating voltage is applied, we have I = V/Z = V/√(R2 + L2 ω2 ) so that 0.5 = 100/√[1002 + L2 ×(100π)2]. Squaring, 0.25 = 104/ (104 + 104π2L2). Since π2 = 10 (nearly), this reduces to 0.25 = 1/(1 + 10L2), from which L = 0.55henry = 55 mH. The value of the capacitor is not given and you are asked to find the voltage drop across it. This is a problem involving resonance, indicated by the current of 0.2A (=10/50) which is limited by the resistor only. At resonance, the voltage drop across the capacitor is equal (in magnitude) to the voltage drop across the inductor, which is ILω = 0.2X0.04 × 2π×1000 = 16π = 50V, nearly. Therefore, the correct option is (e). This is an example of how simple a question can be sometimes. The voltage drop across the capacitor = I/Cω = (2×10-3 )/(2 ×10-6×2π×1000) =0.16V. The following MCQ also is a simple one, but some of you may be tempted to give the wrong answer. q2/2C = ½ × Q2/2C, so that q = Q/√2. Since the voltage across the capacitor and the inductor are equal in magnitude, the circuit is at resonance. Since the voltages (vectors!) across these components are in opposition, the net voltage across them (LC combination) is zero. The entire supply voltage will appear across the resistor. This is equal to 80V, as given in the question. So, the correct option is (e). You should note that the magnetic flux linked per turn is the same for the primary and the secondary, since the coupling coefficient between them is almost unity. The rate of change of flux per turn also is the same, which means the induced voltage per turn is the same for the primary and the secondary. Therefore, the correct option is (a). Labels: a.c. circuit, alternating current, HPPMT, Karnataka, Kerala, LCR circuit, resonance, transformer, vector method for A.C. The vector form gives you the magnitude (qvB sinθ) of the force and its direction which is along the direction of the cross product vector v×B. You should remember that the direction of v is the direction of motion of a positive charge. If you have a negatively charged particle such as an electron, you should reverse the direction of v to get the direction of the force. F = q(v×B + E). This is the Lorentz force equation. deflecting the particle is the Z-component only. The other component should be the X-component since the X-component cannot deflect the charged particle proceeding along the X-direction. There has to be an electric field since the path of the particle is non-circular. All these conditions are satisfied by option (b). Since the electron is negatively charged, the direction of its velocity is to be reversed for finding the direction of the cross product vector v×B. The correct option therefore is (a). You can use Fleming’s left hand rule (motor rule) also for finding the direction of the magnetic force. But, when you apply the rule, remember that the direction of the conventional current is that of positive charge. The vectors B and V are parallel as the components of B are twice the components of V. So the magnetic force on the electron is zero and the correct option is (e). Generally, in problems of the above type, you will have to find the angle between the vectors V and B using cosθ = V.B/ VB. In the present case we have, cosθ = (2+18+4)/ √(12×48) = 1 so that θ= zero. If in a similar problem, the value of θ works out to be 90˚(if cosθ works out to be zero), the correct option would be (c). If the value of θ were neither zero nor 90˚, the path would be helical and the correct option would be (d). Since both atoms are doubly ionized, they have the same charge ‘q’ and since they are accelerated by the same potential difference ‘V’, they have the same kinetic energy, qV. If m1 and m2 are the masses and v1 and v2 are the velocities of X and Y respectively, we have, ½ m1v12 = ½ m2v22 from which m1/m2 = v22/v12 = [qBR2/m2]2/ [qBR1/m1]2, on substituting for the velocities from the centripetal force equation, mv2/R = qvB. Therefore, m1/m2 = (R1/R2)2, given by option (e). (1) Equation of simple harmonic motion: y = Asinωt if initial phase and displacement are zero. Here ‘y’ is the displacement, ‘ω’ is the angular frequency and A is the amplitude. y = Acosωt also represents simple harmonic motion but it has a phase lead of π/2 compared to the above one. If there is an initial phase of Φ the equation is y = Asin(ωt + Φ). y = Asinωt + Bcosωt represents the general simple harmonic motion of amplitude √(A2 + B2) and initial phase tan-1(B/A). Note that ω =√(k/m) where ‘k’ is the force constant (force per unit displacement) and ‘m’ is the mass of the particle executing the SHM. In cases of linear motion as in the case of a spring-mass system or a simple pendulum, period, T = 2π √(m/k) where ‘m’ is the mass and ‘k’ is the force per unit displacement. T = 2π √(I/c) where I is the moment of inertia and ‘c’ is the torque (couple) per unit angular displacement. You may encounter questions requiring calculation of the period of seemingly difficult simple harmonic oscillators. Understand that the question will become simple once you are able to find out the force constant in linear motion and torque constant in angular motion. Angular cases will be rare in Medical and Engineering Entrance test papers. Let us now discuss some typical questions. Maximum velocity vmax = ωA where ‘ω’ is the angular frequency and ‘A’ is the amplitude. Therefore vmax = (2π/T)A = (2π/2)×50×10-3 = 0.157 m/s [Option (b)]. The magnitudes of the velocity and acceleration of the particle when its displacement is ‘y’ are ω√(A2 –y2) and ω2y respectively. Equating them, ω√(A2 –y2) = ω2y, from which ω = [√(A2 –y2)]/y = √(4 –1) = √3. Period T = 2π/ω = 2π/√3. Suppose you place a sphere of mass ‘m’ and radius ‘r’ inside a smooth, heavy hemispherical bowl of radius of 37r placed on a horizontal table. If the sphere is given a small displacement, what is its period of oscillation? The arrangement depicted in this question is similar to that of a simple pendulum. Instead of the usual string, you have a concave surface to confine the bob (sphere) to its path along the arc of a circle. The usual expression for the period, T = 2π√(L/g) holds here also, where the length L = 36r since the length of the pendulum is measured from the centre of gravity of the bob. The point of ‘suspension’ is evidently at the centre of the hemispherical bowl. The correct option is 12π√(r/g) given in (c). What will be the period of oscillation of a simple pendulum of length 100 cm in a spaceship in a geostationary orbit? Well, in any satellite orbiting the earth (in any orbit), the condition of weightlessness exists (effective g = 0), the pendulum does not oscillate and the period therefore is infinite. The period as usual is given by T = 2π√(m/k). Here ‘m’ is the same as the mass of the bob. The force constant can be found by writing the expression for Young’s modulus (since it arises from the elastic force in the cord): Y = FL/A(δL) where δL is the increase in the length of the cord on pulling the bob down with a force F. Therefore, the force constant, F/(δL) = YA/L. On substituting this value, the period is 2π√(mL/YA). 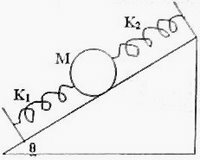 A sphere of mass M is arranged on a smooth inclined plane of angle θ, in between two springs of spring constants K1 and K2 . The springs are joined to rigid supports on the inclined plane and to the sphere (Fig). When the sphere is displaced slightly, it executes simple harmonic motion. What is the period of this motion? You should note that gravity has no effect on the period of oscillation of a spring-mass system since the restoring force is supplied by the elastic force in the spring. (It can oscillate with the same period in gravity free regions also). So, whether you place the system on an inclined plane or a horizontal plane, the period is the same and is determined by the effective spring constant and the attached mass only. The effective spring constant is K1 + K2 since both the springs try to enhance the opposition to the displacement of the mass. The period of oscillation, as usual is given by, T = 2π√(Inertia factor/Spring factor) = 2π√[M/(K1 + K2)], given in option (d). This question was omitted by a fairly bright student who got selected with a good rank. The question setter used the term speed (and not velocity) to make things very specific and to avoid the possible confusion regarding the sign. So what he meant is the maximum magnitude of velocity. The velocity is the time derivative of displacement: v = dy/dt = -Aω(sin ωt + π/4). Its maximum magnitude equal to Aω is obtained when ωt = π/4, from which t = π/4ω. If you remember the basic expression for period in the form, T = 2π√(m/k) where ‘k’ is the force constant, the solution becomes quite easy. From this, k = 4π2m/T2 = 4π2 ×5×10-3/(π/5)2 = 0.5. Since ‘k’ is the force for unit displacement, the maximum force is k times the maximum displacement (amplitude). Therefore maximum force = kA = 0.5×0.3 = 0.15N. [If you remember that ω = √(k/m) you can arrive at the answer since T = 2π/ω]. PALGHAT : Market Road, Big Bazar, 20/68, Ist floor,Palghat-678 014. The Information Bulletin and Application Form can also be obtained by Speed Post/Registered Post by sending a written request with a Bank Draft/Demand Draft for Rs.450/- for General Category and Rs.250/- for SC/ST Category payable to the Secretary, Central Board of Secondary Education, Delhi along with a Self Addressed Envelope of size 12” x 10”. The request must reach the Deputy Secretary (AIPMT), CBSE, 2, Community Centre, Preet Vihar, Delhi-110 092 on or before 10-11-2006. The request should be super scribed as “Request for Information Bulletin and Application Form for AIPMT, 2007”. Even though this is a simple question, you are likely to pick out the wrong answer if you have not understood the basic things. The net force is the centripetal force acting on the bob and is equal to mg + T. You should note that at the highest point both the tension and the gravitational pull are towards the centre of the circle and they add up to produce the net force. If you were asked to find out the net force at the lowest point of the circle, your answer would be (T-mg) because T acts towards the centre (upwards) and mg as usual acts downwards. v2 = √(5rg). You should remember this: If a body is to move in a vertical circle it should have a minimum horizontal speed of √(5rg) at the bottom of the circle. So if you arrange a simple pendulum and push the bob to have a horizontal speed of √(5rg), the bob will just move along a vertical circle. When the bob is moving along a vertical circle, the difference between the tensions in the sting when the bob is at the top and bottom of the circle is 6mg. You may prove this by way of a simple exercise for you. A small steel sphere is suspended using light inextensible string to form a simple pendulum. This bob is initially at rest. What is the minimum speed with which another identical steel sphere should hit the pendulum bob so that the bob just moves along a vertical circle? Treat the collision as elastic. The correct option is the last one: √(5rg). Since the spheres are identical, the sphere which is moving will come to rest at the instant of hitting the pendulum bob, transferring entire kinetic energy to the bob and the bob will move forward with the same speed. Since the critical speed (at the bottom) for the motion along a vertical circle is √(5rg), this is the minimum speed of the moving sphere. The maximum height ‘H’ reached by the projectile is (u2sin2θ)/2g with usual notations. 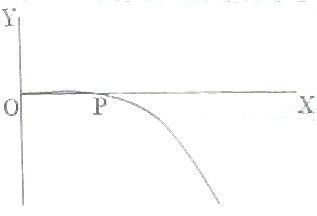 The velocity of the projectile at the maximum height is ucosθ, which is the horizontal component of its velocity that remains unaltered through out its motion. The magnitude of the angular momentum of the projectile at the highest point is = magnitude of linear momentum×lever arm = mucosθ×H = mucosθ × u2sin2θ/2g = mu3cos45×(sin245)/2g = mu3/4√2 g [Option (b)]. Since the rotational kinetic energy E = ½ I ω2 we can write E = ½ I2 ω2/I from which the angular momentum Iω = √(2EI). It will be convenient If you remember the expression for rotational kinetic energy as E = L2/2I where L is the angular momentum. This equation is similar to that for translational kinetic energy in the form E = p2/2m where ‘p’ is the linear momentum. (2) A circular thin disc of mass 2 kg has a diameter 0.2 m. Calculate the moment of inertia about an axis passing through the edge and perpendicular to the plane of the disc (in kgm2). The moment of inertia of the disc about its central axis, perpendicular to its plane is MR2/2. Therefore the moment of inertia about a parallel axis passing through its edge, on applying the parallel axis theorem is MR2/2 + MR2 = (3/2)MR2 = (3/2) ×2×(0.1)2 = 0.03 kgm2. The torque given in the question is not required for working it out. It just serves the purpose of a distraction. Just as you remember the equation, s = ut + ½ at2 in linear motion, you should remember its angular counter part as θ = ω0t + ½ αt2 where θ is the angular displacement, ω0 is the initial angular velocity (which is zero in the problem), and α is the angular acceleration. Substituting the values given, we have, 200 = 0 + ½×α×25 from which α = 16 rad/sec2. This is a simple question, the answer of which is based on the law of conservation of angular momentum. The initial angular momentum of the system is I1 ω. The final angular momentum is (I1 + I2)ω' where ω' is the final angular velocity of the combination of the discs. On equating the initial and final angular momenta, we obtain, ω' = I1ω/(I1 + I2). When the volume of a sphere becomes one-eighths, its radius becomes half. The angular momentum of the earth is conserved in spite of the shrinkage so that we have I1ω1= I2ω2 where I1and I2 are the moments of inertia and ω1 and ω2 are the angular velocities of the earth before and after the shrinkage respectively. Substituting for I1 [= (2/5)MR2] and I2 [= (2/5)M (R2/4)] we obtain ω2 = 4ω1. Since the angular velocity changes to 4 times the initial value, the spin period of the earth (T= 2π/ω) changes to one-fourth of the initial value. So, the duration of the day will become 24/4 = 6 hours. The duration therefore decreases by 18 hours. Generally, if the radius of the earth becomes ‘n’ times the present value, the duration of the day becomes 24n2 hours. The bead gets pressed against the rod because of the tangential acceleration of the rod at the location of the bead. The force with which the bead presses against the rod is F = ma = mLα. where ‘m’ is the mass of the bead and ‘a’ is the tangential acceleration which is equal to Lα. The frictional force therefore is μmLα. It is the centrifugal force which tries to push the bead outwards. Just when the slipping begins, we have μmLα = mv2/L. Initially ‘v’ is zero and as time elapses, its value increases in accordance with the equation, v = 0 + at = Lαt where ‘t’ is the time at which slipping begins. Substituting this value of ‘v’ in the above condition for slipping, we obtain μ = αt2 from which t = √(μ/α). The network shown in Fig 1 is redrawn in the second figure shown side by side with Fig1. You can easily understand that the network has two identical branches, each containing a parallel combination of two capacitors in series with a single capacitor.The parallel combined value 2C in series with C makes a net value 2C.C/(2C+C) = 2C/3. The parallel combined value of the two branches is the equivalent capacitance between A and B and is equal to 4C/3 [Option (e)]. This is a very simple question which you will occasionally get. Since the closed surface contains a dipole, the electric flux leaving the surface is zero. Note that the outward flux due to the positive charge of the dipole is balanced by the inward flux due to the negative charge of the dipole. (a) F/4 (b) 3F/4 (c) F/8 (d) 3F/8If Q is the initial charge on B and C and ‘r’ is the distance between their centres, the initial repulsive force between B and C is F= (1/4πε0)(Q2/ r2). When the uncharged sphere A is brought in contact with B, they share the charge Q and each will have a charge Q/2 since they are identical spheres. When the sphere A is then brought in contact with C they will share the total charge Q + Q/2 = 3Q/2 equally and each will have a charge 3Q/4. On removing the sphere A we have sphere B with charge Q/2 and the sphere C with charge 3Q/4. The new repulsive force between B and C is evidently (1/4πε0)(Q/2)(3Q/4)/r2 = (1/4πε0)3Q2/8r2 = 3F/8 [Option (d)]. The net electrostatic force on the charge Q at the centre is zero since the force on Q due to each negative charge is balanced by the force due to the negative charge at the diagonally opposite corner of the cube. (1/4πε0) [Qq/(√2 a/2)2] = (1/4πε0) [Q2/(√2 a)2] + √2 × [(1/4πε0) ×(Q2/a2)].The term on LHS is the attractive force between –Q and q which are separated by the distance half of √2 a. The first term on RHS is the repulsive force between –Q and the diagonally opposite charge –Q (which are separated by √2 a). The second term on RHS is the net repulsive force between –Q and the remaining two charges (-Q each). Hence we obtain 4q = Q + Q(1+2√2) from which q = Q(1+2√2)/4 [Option (b)]. The electrostatic potential energy of the charge at A ia (1/4πε0)(Q.Q/AB + Q.Q/AC) since the charges are of the same value, Q=2μC. Since AB.AC=32, AB = 32/AC. Substituting this in the equation, AB + AC = 12, we obtain 32/AC + AC = 12. Rearranging, (AC)2 – 12AC + 32 = 0, which yields AC = 8 or 4. Since AB.AC = 32 cm2, if AC = 8 cm, AB = 4 cm and vice versa. Therefore potential energy = (1/4πε0)[(4×10-12)/(4×10-2) +(4×10-12)/(8×10-2)] joule. Since 1/4πε0 =9×109, the potential energy works out to 1.35 J, given in option (d). Now consider the following M.C.Q. :Two isolated copper spheres of radii 3cm and 6cm carry equal positive charges of 30 units each. If they are connected by a thin copper wire and then the wire is removed, what will be the charge on the smaller sphere? (a) 60 units (b) 40 units (c) 30 units (d) 20 units (e) 10 unitsThe total charge (Q1+Q2) in the system is 60 units. Since the connecting wire is thin, its capacitance can be neglected. Even though the potentials of the spheres are different initially, their potentials will become the same when they are connected by the copper wire. An infinite number of charges each equal to –q coulomb are placed on a straight line at x = 1m, 2m, 4m, 8m,16m,…….. What will be the potential at x = 0 due to these charges? (a) infinite (b) 2q/4πε0 (c) –q/4πε0 (d) –2q/4πε0 (e) zeroThe potential is certainly negative since a negative charge will produce negative potential only. You should supply the sign of the charge in the expression for the net potential. The potential at x = 0 is given by, V = (-q/4πε0)(1+ ½ + ¼ + 1/8 + 1/16 + ………). Since the infinite series yields a value equal to 2, the answer is –2q/4πε0. When you place a positive test charge at the centre of the circle, it will experience zero net force since it is pulled equally by the nine charges arranged symmetrically all around. Therefore, the electric field at the centre is zero. You will find all the posts on Electrostatics in this site by clicking on the label ‘electrostatics’ below this post. According to Lenz’s law, the induced current will always oppose the change which causes it. Indeed, the induced current has to oppose the change because, otherwise the change which causes the current will persist and the current will continue to flow once it is started. 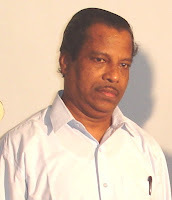 You will then have a supply of energy (in the form of electric current) without any external agency doing any work. This will then violate the law of conservation of energy, which is impossible. So, Lenses law holds good in accordance with the law of conservation of energy. Option (d) is the correct answer. The correct option is (e). Inertia in Mechanics is the property by which a body (or, a mechanical system) tries to oppose any change in its state of rest or of uniform motion. Inductance is the property by which an electric circuit tries to oppose any change of current flowing in it. So, inductance and inertia are comparable. A bar magnet is released into a copper ring which is directly below it. What about the acceleration of the magnet? Greater than ‘g’ or equal to ‘g’ or less than ‘g’? The acceleration is less than ‘g’ since the falling magnet will generate an induced current in the copper ring and the induced current will oppose the motion of the magnet. A jet plane is flying horizontally at a speed of 1800 km/hour. What is the potential difference developed between the tips of its wings if the wing span is 25m? Earth’s magnetic field at the location is 0.4 gauss and the angle of dip is 30˚. The motional emf developed between the tips of the wings is given by V = BvLv where Bv is the vertical component of the earth’s magnetic flux density, L is the distance between the tips of the wings (wing span) and ‘v’ is the velocity. [Note that this emf is produced because of the cutting of the vertical field lines and this is why we use the vertical component of the field]. We have Bv = Bsin30 = 0.4×10-4×½ = 0.2×10-4 tesla. Also, L = 25m and v = 500m/s. The emf then works out to be 0.25V = 250mV. [Note that gauss is the cgs unit of magnetic flux densitywhich is often used. One tesla = 104 gauss]. The motional emf induced when a conductor moves perpendicular to a magnetic field is the product of the area swept per second (by the conductor) and the magnetic field. Therefore, in the present case, induced voltage = area swept per secong by a radius × B = n πr2B = (1800/60) × π ×(0.05)2 ×1= 0.2356V. The correct option therefore is (a). This mcq is similar to the previous one. The voltage induced will be four times the previous value since the area swept is four times. The correct option is (b). This is a simple question but there is chance of committing a mistake! The correct option is neither (a) nor (b). The potential at the ends (with respect to the mid point of the rod) will be the same (0.235V) so that the potential difference between the ends will be zero [Option (e)]. You should note that the motional emf is generated because of the shifting of mobile charge carriers due to the Lorentz force. The emf induced = n πr2B = 20π(0.1)2 ×0.1 = 0.02 π volt = 20π milli volt [Option (c)]. The induced emf = -dΦ/dt. Therefore, -2Xt = 9 when t=3s so that -6X = 9, from which X = -1.5. The correct option is (d).